I’d never read any of the titles in the ‘highly appraised Jim Meldrum series’ (sic: courtesy of the press release) and I don’t feel I have now, as the Edinburgh Inspector plays a minor role in Frederic Linsday’s The Endings Man and we never see the case from his viewpoint. Lindsay’s protagonist is a crime writer called Barclay Curle who finds himself a suspect when a murder is committed in the style of the killer in his latest book. Curle turns detective himself to clear his name. Add Curle’s literary agent, a mistress, a dead child, an unhappy marriage, a disturbed fan, a creepy bookseller, a lonely widow and the mysterious reappearance of Curle’s childhood bully, and there is the feeling of a quart of a story being pressed into a pint pot of a book. Curle’s actions, given that he is innocent of murder, are sometimes perverse. Nevertheless, this is a page turner and it is good to read about and recognise a very contemporary Edinburgh and its environs – enough for me to seek out previous titles in the series to find out more about the elusive Inspector. For as long as children clap their hands and believe in fairies the name of J. M. Barrie will be remembered. 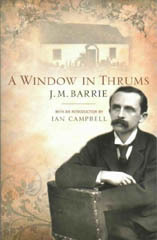 The welcome reprint of his book A Window in Thrums sprinkles magic dust of a different kind and deserves to be read as widely as it was when first published in 1889. The linked short stories of housebound Jess, Hendry, Leeby and their friends and neighbours are as detailed as a Dutch painting. They are stories of a bygone Scotland – and if that Scotland, that ‘kailyard’ Scotland may never have existed, so what? This is fiction. Why do we read fiction? To understand other people and situations, to be moved, amused, transported, illuminated… A Window in Thrums ticks all these boxes. Take Leeby, apparently awestruck and dumb during her visit to the minister’s smart new wife who thought ‘her wits sadly in need of sharpening,’ coming home and describing to Jess the manse furniture down to the chairs that ‘dinna match’; and her hostess’s appearance down to the ‘twa warts on her richt hand.’ Nothing blunt about Leeby’s wits. Or there’s the pig-sty which saw many a male gathering – ‘only memorable when Tammas Haggard was in fine fettle’ – discussing such subjects as the meaning of humour and the power of female beauty. ‘Thirty, was he? said Hockey. Man, I’d buried twa wives by the time I was that age, an’ was castin’ aboot for a third. I mind o’ them, Hendry interposed. Ay, Hockey said, the first twa was angels. All human life is to be seen through the window in Thrums. Do have a look. Encarnita’s Journey is not the first time that Joan Lingard has mixed fact with fiction; she did it very successfully with After Colette for example, and with some of her wonderful books for children. This book begins and ends in modern Edinburgh and in between there is the (fictional) tale of Encarnita’s life, starting with her birth in Yegen, in the foothills of the Sierra Nevada, in 1920. Into this remote village in real life came the English writer Gerald Brenan, bringing in his wake members of the Bloomsbury Group. ‘Don Geraldo’ teaches Encarnita English and tells her about places she longs to see, inspiring her to make her journey. It was hard to get involved because right at the beginning I couldn’t believe in the prodigy infant Encarnita. Would a three year old peasant child think in these perfectly punctuated words: ‘I, too, will have soap, (thought Encarnita,) and shoes like the lady.’? I doubt that even her encounter with Virginia Woolf could effect such an instant education. Much of the book is in this slightly stilted language and one must assume that a writer as practised as Joan Lingard used it deliberately, but it put the characters at a distance and made the novel unengaging. As Scotsman readers know, in 2004 Alexander McCall Smith (of No. 1 Ladies’ Detective Agency fame) started writing a daily serial for the paper called 44 Scotland Street. This was eventually collected in book form and was a bestseller on both sides of the Atlantic. 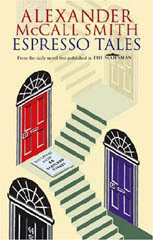 Espresso Tales is the second series, here by popular demand. I was unfamiliar with the characters who inhabit the Edinburgh New Town street but got immediately sucked into their lives. Reading Espresso Tales without having read 44 Scotland Street was like having lunch with a friend in a café (a New Town café of course) where your glass and your coffee cup are always full and you settle down and catch up with the gossip; and, even though the people your friend talks about are unknown to you, you sit there riveted, and before you know it the café staff are wiping tables and stacking chairs and looking at their watches. And I imagine that if you were catching up from previous acquaintance with Domenica, Pat, Matthew, Irene, Bertie, Dr Fairbairn, Bruce et al then you would quite simply refuse to leave until you were fully up to date. Other parts of Scotland put in their appearances – one chapter is called ‘Bruce has Uncharitable Thoughts about Crieff’; Stuart and Bertie venture through to Glasgow; Ramsey Dunbarton relates to the long-suffering Betty his story of ‘a Perthshire weekend’- but Edinburgh is as much a character as any of the humans, so much so that I paused to wonder why the stories have had such universal appeal when there are so many references that would go unrecognised by most of the world, such as the names of real Edinburgh folk and the intricacies of the 23 bus route. It must be the way he tells them. Alexander McCall Smith has, as anyone who has heard him talk will verify, the most infectious laugh, like that of a delightfully naughty schoolboy, and somehow his writing has the same tone and we cannot help but go along with him. One word of warning though: if anyone asks you to a picnic in Moray Place Gardens be sure to ask about the dress code.